Kids Go Further with FUN BUSDriving the LOVE of FITNESS to the Young Child! 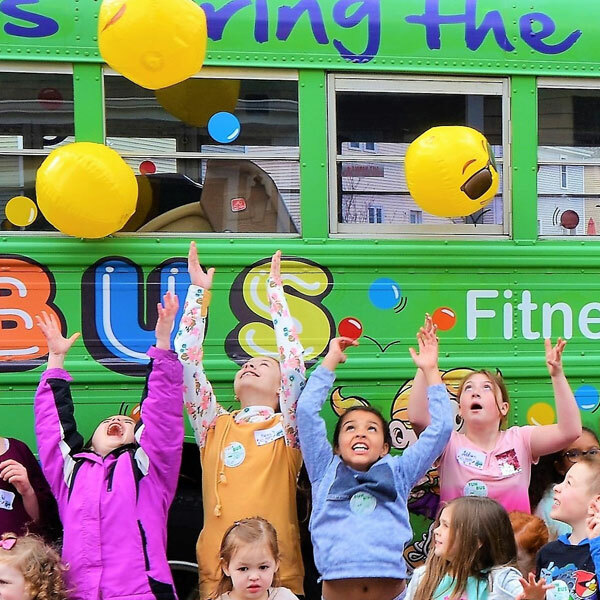 FUN BUS is a mobile "gym on wheels" offering fitness FUN classes to preschool & childcare facilities with children ages 18 months - 7 years in a colorful, FUN and safe environment. 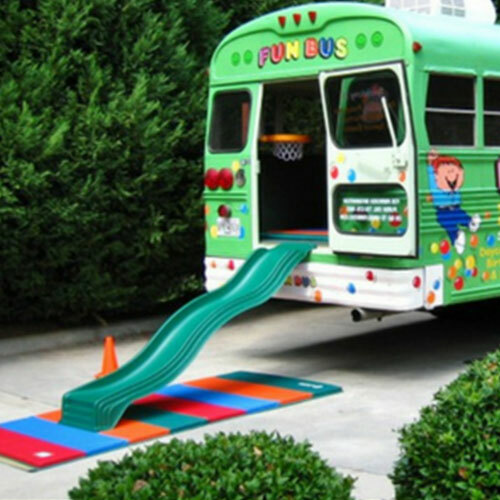 FUN BUS also specializes in summer camps, school events and birthday parties too! So, learn and grow during milestone years with FUN BUS! Building memories, muscles and healthy habits which last a lifetime! Parents & Kids Love FUN BUS! "My 4 & 6 year old daughters and their friends both LOVED the FUN Bus!! The best part was for the parents - sitting in my living room, sipping coffee, and watching from afar as their kids had an hour of exercise & FUN! I highly recommend the FUN Bus!!" 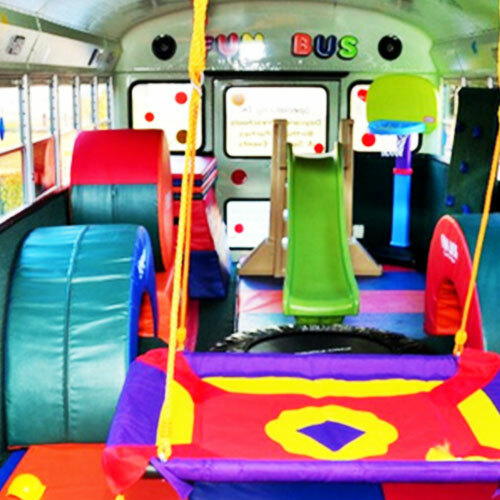 A FUN BUS visit begins with two professionally trained FUN instructors who lead children through skills and drills, courses and games on kid approved gym equipment. Whether it's soccer or karate week, circus or shark week... we do everything our competitors do and more in a 35 foot refurbished school bus. 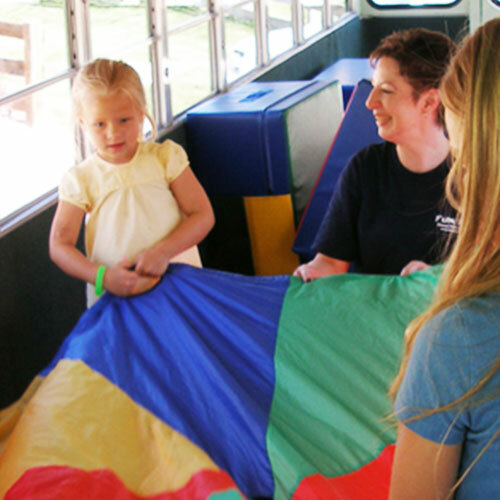 Kids love to "shake their sillies out," bounce, swing, climb and cheer with all their friends on FUN BUS days! Parents are thrilled too, with easy online registration, weekly updates, parent notes and color pages. FUN BUS classes cool down with a reward, singing our BYE BYE FUN BUS song and best of all... sliding out of the FUN BUS and into the loving arms of a trusted adult. Bus never moves with children on board. Fully Climate Controlled. We Come Rain or Shine! At FUN BUS, We have developed an innovative and fun approach to fitness that kids and parents love. Our priority is to a provide a safe non-competitive environment with FUN instructors who are always nurturing and attentive. Our lesson plans and equipment rotate weekly to include new lessons for optimal fitness FUN. 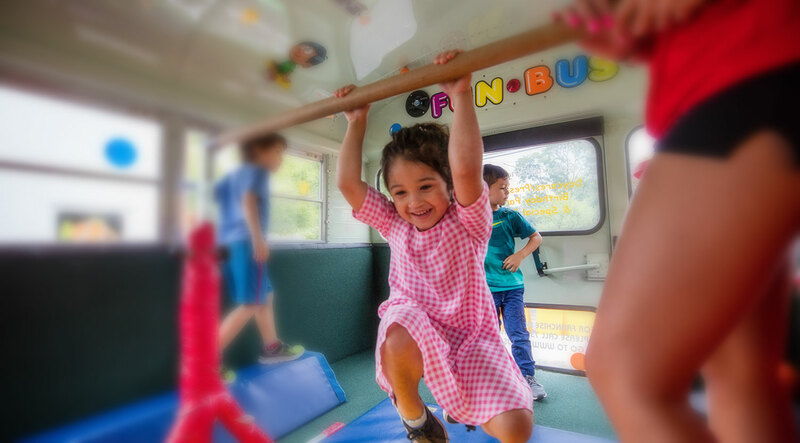 The mission of the FUN BUS is to enhance the lives of young children by providing a FUN and safe environment where kids can build their self-esteem, improve coordination and gross motor skills through physical fitness and social interaction. Most importantly, our goal is make fitness FUN! Our picture and video gallery help to demonstrate what FUN BUS is all about. Browse around to find out why both parents and children love us! 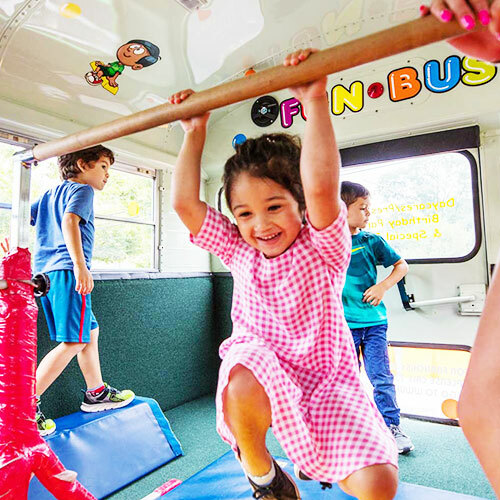 FUN BUS, Fitness FUN on Wheels is always looking for FUN, fit, outgoing, energetic people to teach fitness FUN classes to preschool aged children at preschools and daycares in the South Shore Mass area. Have questions about FUN BUS? View our frequently asked questions to see if your question has already been answered, or simply contact us for more information.